Some information for those who may be new to the hobby – one can start at any age! There are many species of bees – some solitary, some organised into social groups. The most sophisticated of the social bees is the honeybee, Apis mellifera. Honeybees live in colonies consisting of several thousand individuals, mostly workers, which are sterile females. The bees build combs of beeswax, in which they store honey and pollen, and in which also they rear their young. Each colony has a single queen – a fully developed female – who lays the eggs from which all the workers, the drones (males) and eventually her successor will emerge. People have been keeping bees since ancient times. Bees are wild creatures, not pets, and have no interest in human beings, but will happily inhabit suitable hives if beekeepers provide these. 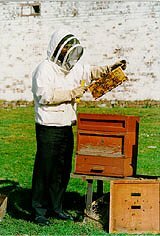 The task of the beekeeper is to understand the bees and to provide suitable accommodation, and food if needed. If the conditions are good the bees will thrive and will produce surplus honey which the beekeeper can extract. A student beekeeper examining a comb taken from a hive.